Telltale's latest take on TWD avoids third season syndrome with a confident double-bill. A promising, assured start, and a welcome return to form for Telltale. If the Walking Dead TV show can’t decide whether it wants to be a dark, maudlin drama or a schlocky, gory thrill-ride, Telltale’s interactive adaptation has established a more consistent voice that allows room for a bit of both without leaving you suffering from tonal whiplash. Its problem is that between the comic books, the TV series and the games, the cyclical nature of its narrative has become ever more apparent. Still, if a riff is catchy enough then it can bear a certain degree of repetition—and though some of its scenarios are familiar, Season Three opens with a double-header that shows The Walking Dead at its best, with characters you can care about, a couple of genuinely shocking surprises and a clutch of well-staged set-pieces. It certainly helps that Telltale’s new engine finally feels fit for purpose. While Batman still had its share of performance issues, there’s little to grumble about in Ties That Bind: everything runs that much smoother, with snappier transitions that give the action sequences a greater sense of urgency. Press a button to jab a sharp object through a walker’s skull and the only delay between tap and squelch is in the swing. Better lighting and superior cinematography enhance the visual storytelling, too: episode one’s terrific opening offers a shivery reminder of the time the dead first started coming back to life, following a wonderful corridor shot with a jittery handheld camera to heighten the growing unease. It’s here that we meet new protagonist Javier Garcia, a disgraced former baseball star who quickly moves from absentee son to surrogate father as his story picks up a few years later. He’s now on the road with sister-in-law Kate and her two stepkids, the sullen Gabe and the more immediately likeable, level-headed Mariana. Theirs is the kind of dysfunctional family unit we’ve seen before, but there’s some solid character work here—and a winning line in gallows humour—that establishes the bond between them. Even as they snipe at one another, there’s a clear affection behind the barbs. Then, of course, there’s Clementine. A few years have passed since the end of Season Two, and she’s now significantly more hard-bitten and distrusting than ever—albeit still fundamentally decent enough to let Javier hang onto an item of emotional worth. It’s startling to see her like this, but we soon come to understand why, via a pair of playable flashback sequences across the two episodes. The first draws a firm line under last season’s events, and for at least two of the possible endings resulting from your pivotal choice in the finale, the outcome here is especially grim. It’s a reminder that your decisions can only really shape your journey rather than its destination, but in a world where surviving is an act of defiance, there’s something to be said for a choice that lets you spend a little longer with someone you care for. These moments are slightly more problematic in light of the main narrative. As players, we want to know what happened to Clem between then and now, and so it makes sense for Telltale to fill in the gaps. But this isn’t an ensemble piece where each character’s perspective is explored; outside these flashbacks, the story is told exclusively from Javier’s viewpoint. Taking time out to explore the backstory of someone he’s only recently met feels strange, and it also leads to a certain disconnect in terms of your decision-making. 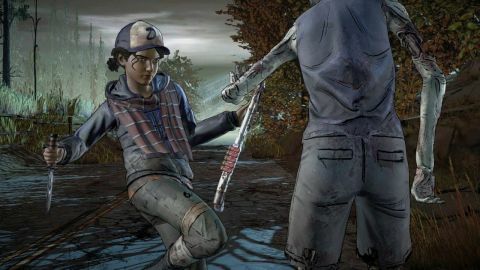 We all know Clementine, but Javier doesn’t: though Telltale steadily establishes an uneasy alliance between them, there are key decisions we’re invited to make as Javier with knowledge he couldn’t possibly have. There’s a similar problem in a later scenario. After arriving at a new settlement, it’s not long before Javier indirectly causes a crisis, and yet characters are all too ready to trust him over companions they’ve presumably spent a good deal longer with. Still, that’s an issue from which the TV show also suffers, and at least Javier seems a less impetuous and unhinged leader than Rick Grimes. Otherwise, there’s much to admire here, from a darkly amusing exchange between Javier and Clem about their different terms for the dead (“What do you call the ones that run?”) to a torchlit tunnel escape that concludes with a tense confrontation and a choice that threatens to have serious ramifications for the next episode at least. An optional DIY surgery scene is every bit as squirmingly grisly as Clem’s wound stitching in last season’s opener, while an appearance from a familiar face will delight fans of the comic and/or TV show. It’s clear that the 'graceful exit' imagined by one character isn’t going to happen any time soon for The Walking Dead, but Ties That Bind makes a surprisingly convincing argument for it to keep shuffling onward.